Hotel Les Cimes du Soleil is a wonderful new addition to our programme. Featuring ski-in, ski-out accommodation with good facilities in the heart of this quaint car-free resort, we're sure it will be a popular destination. 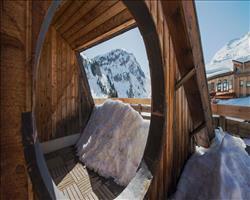 Soak up the sun on the fantastic terrace after a long day skiing the large Portes du Soleil ski area. Later in the evening, you can enjoy a drink in the cosy bar after dinner. Creative workshops with an exhibit of works by the children. Activity leaders are qualified and speak English. All rooms are non smoking and have Wi-Fi, flatscreen TV with satellite channels, safe and hairdryer. We update Hotel Les Cimes du Soleil's details often, but facilities do change. e.g. some extras listed by the supplier as "free" or included might only be for the first time you use them, or for one time per party, then charged for further use. If any specific feature is essential to your holiday, make sure you ask us to confirm the details of it before you book your holiday. Portes du Soleil: €225. Ask for a quote when booking Hotel Les Cimes du Soleil.